Social protests spread across northern and southwestern Colombia, and into the city of Medellin on Thursday as locals went on strike over lacking infrastructure, water and electricity shortages, and drought. In the Catatumbo region of the northern state Norte de Santander, some 5,000 inhabitants reportedly took to the streets with banners and chants to show their anger with local authorities over what they called government negligence that caused the local Zulia river to dry up, according to national media RCN. The Zulia river supplies the water of 12 municipalities in the state and is in immediate danger of drying out. Residents of Catatumbo say the solution to the problem is building a dam, which would regulate the river flow. For now, the rice crops are suspended because of water shortage, meaning many inhabitants do not have work or food. Catatumbo has seen numerous riots over the past years over ongoing claims of government neglect. In several municipalities along Colombia’s Pacific Coast, protests broke out to demand improvement access to health care , education and energy. The locals claimed they have suffered a days-long energy black-out. According to Cali newspaper El Pais, the protests have mobilized a staggering 240,000 people in the remote area. Citizens in Guapi, a coastal municipality in Cauca, have been protesting since Sunday. The strike reached new heights on Wednesday, when strikes spread to neighboring Timbiqui, also in Cauca, where citizens blocked a plane from flying to Cali, according to national newspaper El Tiempo. The strike that started in Cauca spread further down the pacific coast to Nariño. In Colombia’s most southwestern state, locals were also asking better access to public services and the improvement of roads. In southern state of Putumayo, some 25 thousand farmers have been involved in weeks-long protests demanding the national government end controversial aerial fumigation of coca crops and carry out due diligence in the awarding of oil contracts. The protesters have been blocking the main oil transport corridor in the state of Putumayo, making sure no machinery or oil workers pass through, reported press agency Agencia Prensa Rural. When Defense Minister Juan Carlos Pinzon visited the area he announced arrival of more security personnel to ensure free movement of oil companies’ employees. However, according to news agency Colprensa, the locals have said they do not want more troops, but social investment, as the rest of southern Colombia are shouting for. In Medellin, Colombia’s second largest city, local street-merchants demonstrated against the city’s authorities, who allegedly closed informal sales booths on one of the city center’s main avenues. More than 30 people gathered in the intersection between La Playa and Oriental, the two main avenues in the center of Medellin. 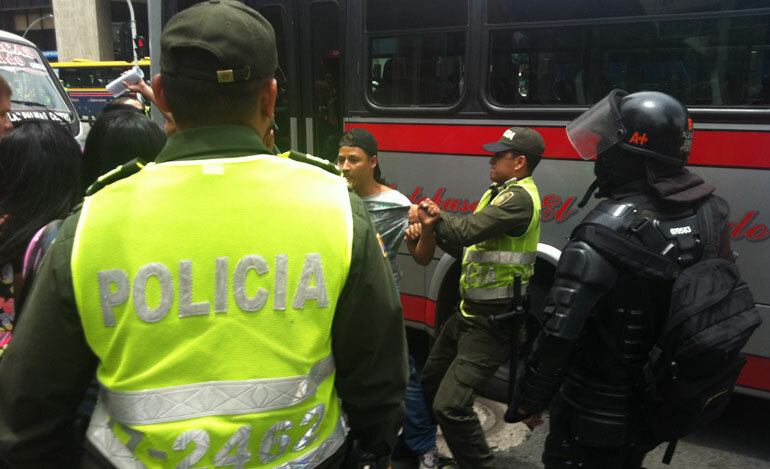 The protesters told Colombia Reports that police had closed their stands and taken their goods of street vendors who were unable to show proper permits. Riot police stepped in when protesters attempted to block the road with scraps and burning planks of wood. However, the agitation drew a larger crowds and onlookers began defending the vendors from police. Unlike in October 2012, when operations against illegal street vendors caused major riots, authorities were able to calm the situation. Locals in the northeastern state of La Guajira had entered into an indefinite protest earlier this week to demand national action in the face of an ongoing water crisis that may be deepened in the coming months as the region is suffering a prolonged drought. Protesters seeking a dialogue with Colombian President Juan Manuel Santos clashed with National Police forces Monday, in demonstrations said to paralyze parts of the state. Protesters demanded a solution to the immediate nutritional needs of the population, as well as the deeper social inequalities in the state, according to La Guajira’s Diario del Norte newspaper. The mostly peaceful protests grew heated in the state capital of Riohacha, where a bus was burnt in front of university and roads were shut down by protesters. 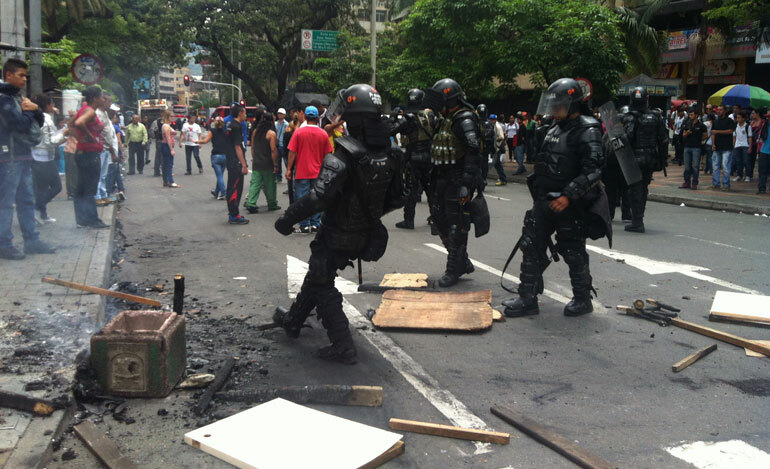 At least eight people were detained and four injured in clashes with Colombia’s riot police, according to RCN news.